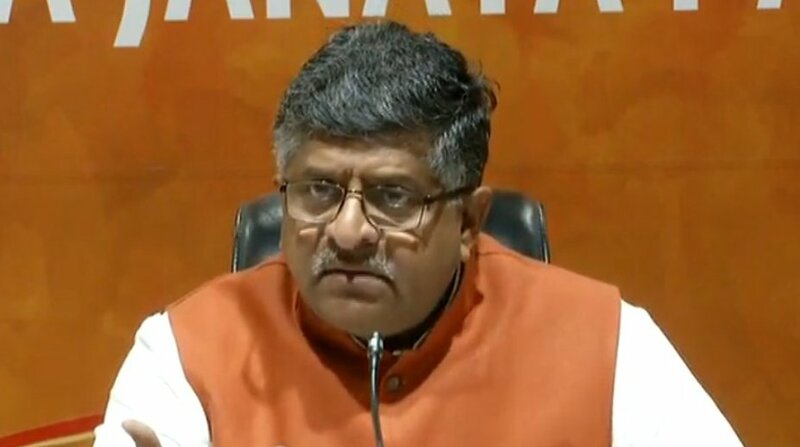 Addressing a press conference in the evening on Sunday, Union Law Minister Ravi Shankar Prasad said that the Congress, the Bahujan Samaj Party (BSP) and the Samajwadi Party (SP) are deliberately supporting violence for selfish political reasons. The BJP countered the accusation of Congress president Rahul Gandhi that the party was “anti-Dalit” and trying to “change the SC/ST Act”. Addressing a press conference on Sunday evening, Union Law Minister Ravi Shankar Prasad said the Congress, the Bahujan Samaj Party (BSP) and the Samajwadi Party (SP) were deliberately supporting violence for “selfish political reasons”. “Dr Ambedkar said that Dalit movements have never been violent and will never be violent,” reminded Prasad before launching a scathing attack on the three opposition parties. “Congress, SP and BSP are supporting violence in a planned manner in an attempt to destabilise the situation,” said Prasad in reference to the violence that erupted on 2 April when various Dalit groups called for ‘Bharat Bandh’. “The Modi government is trying to strengthen the SC/ST Act. Rahul Gandhi is lying when he claims that the government is trying to finish the Act. This proves the situation and the nature of the Congress,” Prasad told reporters at the conference which was also attended by Thawar Chand Gehlot, Union Minister of Social Justice and Empowerment. Gandhi had previously criticised PM Modi and BJP’s ideology. Attaching a collage of photos in his tweet which contained PM Modi’s tweet on honouring Ambedkar and multiple photos of vandalised statues of the Dalit icon, Gandhi said “the oppressive ideology, to which PM Modi belongs, can never respect Dalits and Ambedkar”. 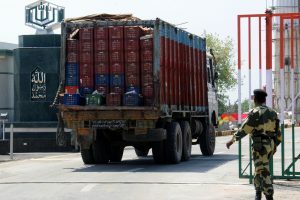 Reacting to this on Sunday, the Union minister also highlighted the work done by the government led by Prime Minister Narendra Modi. He said that the government has extended protection under the law to women from the various backward communities. Prasad, who is also the Union Information Technology Minister, said that the BHIM app is one of the many initiatives undertaken by the Modi government in line with Babasaheb Bhimrao Ambedkar’s vision for the upliftment of the backward classes. “We created the BHIM App in November 2016. At the time per day download (of the app) was 4,000. Today it is 40-45 lakh per day,” informed the minister. Prasad also drew attention to a circular issued by the BSP when it was in power in Uttar Pradesh in October 2007. The minister said that the BSP government had then asked officials not to prosecute any innocent while ensuring that the victims under the SC/ST get quick justice. “The Union government was not party to the case in which the Supreme Court announced its judgment on the SC/ST Act,” Prasad said referring to the 20 March verdict. He claimed that the opposition parties are playing politics because SCs, STs, backward classes, poor, etc, have joined the BJP in large numbers. Thawar Chand Gehlot, Union Minister of Social Justice and Empowerment, added that the Congress has never been concerned about the welfare of Dalits. “Only the BJP is concerned about the welfare of the SCs, STs and backward classes,” said Gehlot adding that Modi’s increasing popularity has made the opposition spread casteism and communalism in the society. “Kanshiram never supported violence but Mayawati has started walking on the path of violence,” said Gehlot. On 20 March, a two-judge bench ruled that no one can be arrested under the Scheduled Castes and the Scheduled Tribes (Prevention of Atrocities) Act without prior permission. The bench said a public servant can be arrested under the Act only after permission is obtained from the appointing authority.